A Blues Clues costume for your pet, or your favorite stuffed animal. This one fits an extra large pet that measures 22-24 inches from the back of the neck to the hind quarter where the tail starts. 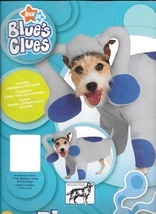 This costume includes the headpiece and pet jacket. THIS COSTUME IS NEW AND HAS NEVER BEEN WORN!! Shipping and Handling explained below ALL SALES ARE FINAL.